Birkhead Mountain Wilderness Area – Throughout the day, January 16, 2010, NC Wing Civil Air Patrol members participated in a statewide search and rescue exercise, conducted missing person searches and simulated disaster relief missions. Due to the terrain in the Uhwharrie Mountains, ground teams reported spotty communications, which is a real world problem. Even cell phone contact was impossible at times. Mission Incident Commander Maj. Andy Wiggs stated that Ground Team Bravo had been dispatched to locate a missing person in the Birkhead Mountain area, located about four miles South of the Asheville Airport. 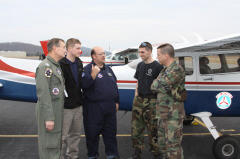 An aircraft, piloted by Capt Chuck Dawson, with Mission Observer 2nd Lt. Chuck Clayton, and Mission Scanner SM Jonathan Hope was assigned to conduct a grid search and to coordinate with Ground Team Bravo. At the same time two additional ground team members, Maj. Brian Buczkowski and C/2nd Lt. Noah Hoffer, were attempting to join up with Ground Team Bravo to provide additional radio support, but they lost communications with mission base. The mission pilot, Capt. Dawson, mentioned that his aircrew was flying their first mission as trainees. He commended the manner in which they handled communications and spotted the subject on the ground.